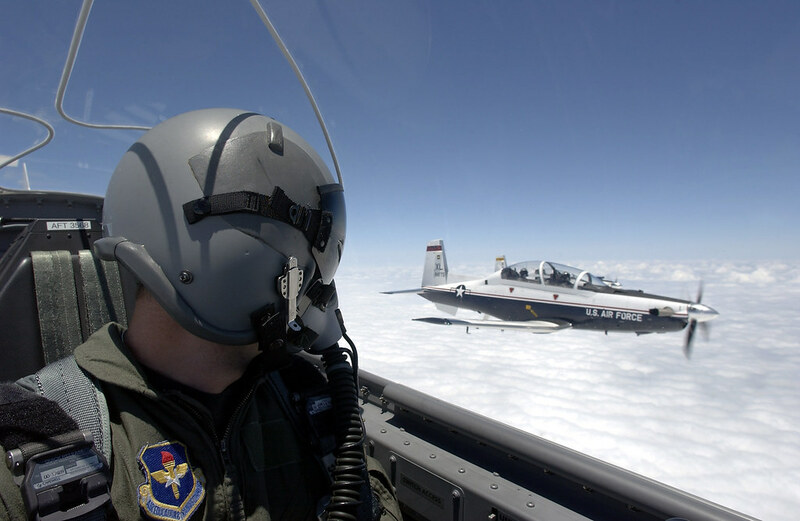 For nearly two decades the T-6A Texan II has been the gateway for hopeful students to enter into the realm of becoming Air Force pilots. The Texan II is a two-seat, single-engine aircraft capable of aerobatic maneuvers and has a zero altitude/zero airspeed ejection seat for student safety. In the 1980s, aircraft performance and avionics were advancing at a rapid rate. The Air Force recognized a need for a new training platform to replace its aging fleet of T-37 and T-38 training aircraft. To meet this need the Air Force planned to purchase 650 T-46 Eaglet trainer aircraft but the program was cancelled shortly after its first flight in 1985 due to budget cuts. After the loss of the T-46 program, the Air Force helped develop the Department of Defense Trainer Master Plan, which was published in April 1988, to identify the types and numbers of aircraft required to meet mission needs. The program planned to use commercial aircraft, as much as possible, to reduce development time and cost. Before being formally named in 1997, the T-6A was identified in the TMP as aircraft portion of the Joint Primary Aircraft Training System, which included a suite of simulators, training devices and a training integration management system. On June 22, 1995 Raytheon Aircraft Corporation was selected to develop the JPATS for the Air Force and Navy. The program budget was $7 billion and called for the delivery of 372 aircraft for the Air Force and 339 for the Navy. The base design for the T-6A was based off of the PC-9. Almost every system of the PC-9 was redesigned and almost every component was procured to address government requirements which were specific for military missions and usage. The aircraft was built with stepped-tandem seating in a single cockpit, placing one crewmember in front of the other, with the student and instructor positions being interchangeable. T-6 Texans fly in formation over Laughlin AFB, TX on May 19, 2004. The T-6 is replacing the T-37 as the primary trainer for Air Force pilots. The development of the T-6A also saw many cost-saving and life-cycle initiatives including using primer on rivet holes, before assembly, which improved corrosion prevention. The developers also switched from using safety wire to self-locking screws, which eliminated the cost of safety wire, reduced foreign-object damage and reduced manufacturing and life-cycle costs. 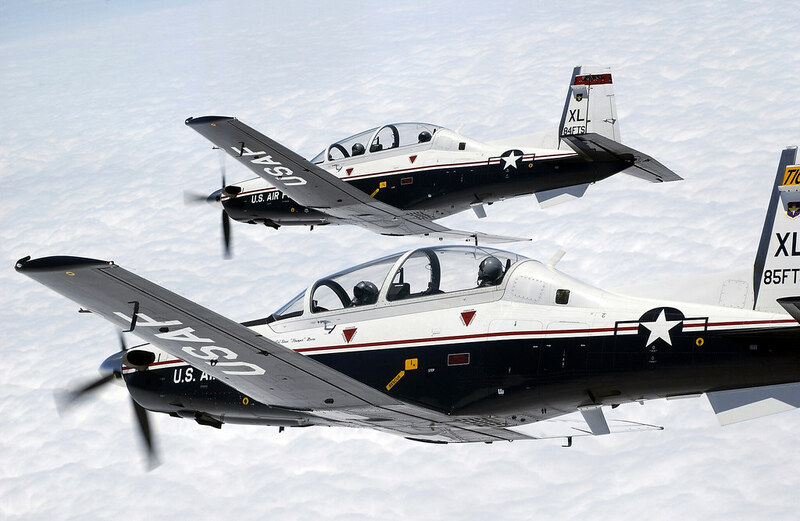 Both the Air Force and Navy training commands agreed the T-6A would be designated the Texan II because of the major role the original T-6 had played in training both services’ pilots during World War II. The first flight of the initial production aircraft occurred on July 15, 1998. 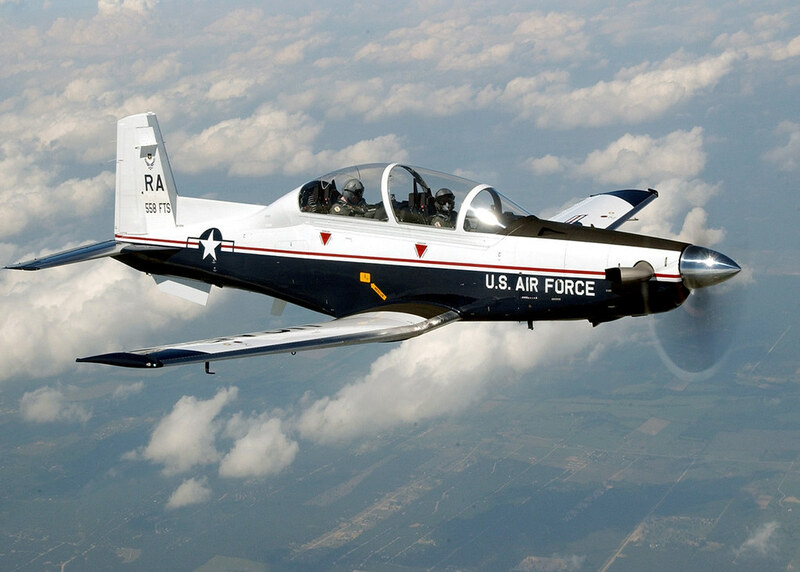 The first operational T-6A was delivered to the 12th Flying Training Wing, Randolph Air Force Base, Texas, on May 23, 2000. 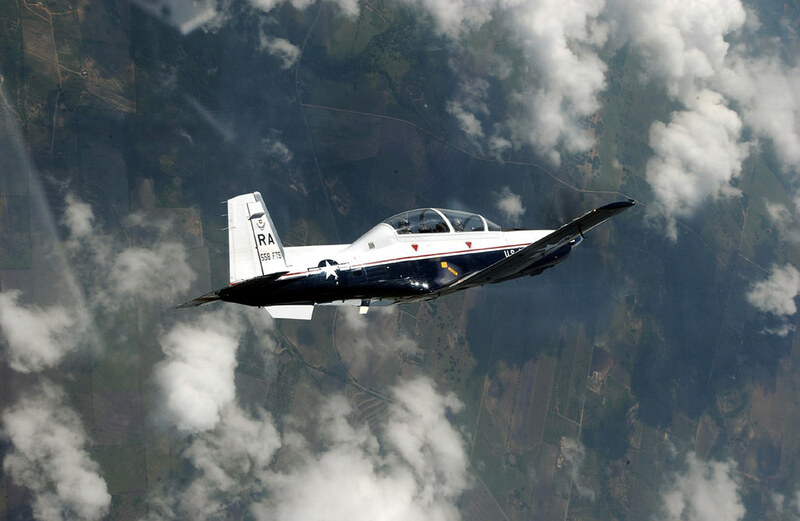 The T-6A Texan II is a single-engine, two-seat primary trainer designed to train Joint Primary Pilot Training, or JPPT, students in basic flying skills common to U.S. Air Force and Navy pilots. The T-6A is used to train Joint Primary Pilot Training students teaching them basic aviation skills to progress to one of four tracks: the Air Force bomber-fighter or the Navy strike track, the Air Force airlift-tanker or Navy maritime track, the Air Force or Navy turboprop track or the Air Force-Navy helicopter track. 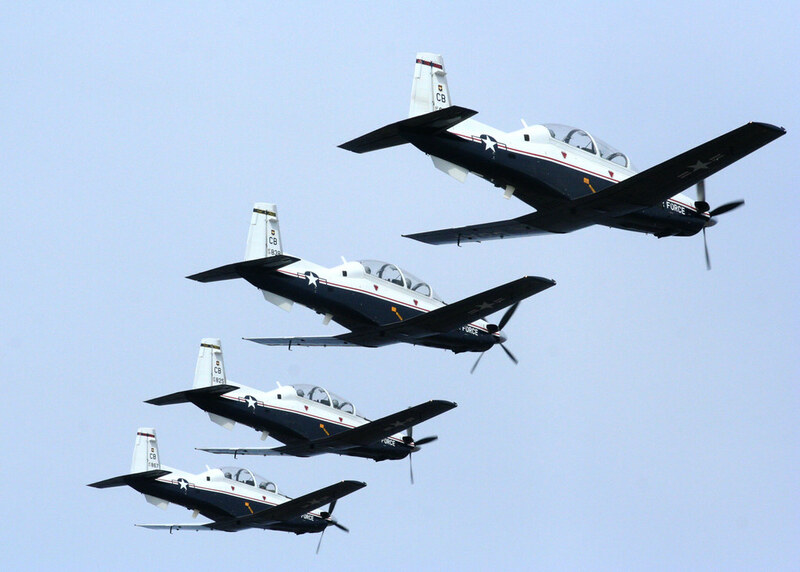 Instructor pilot training in the T-6A began at Randolph AFB, Texas, in 2000. JPPT began at Moody AFB, Ga., October 2001 and is currently conducted at Columbus AFB, Miss., Vance AFB, Okla., Laughlin AFB and Sheppard AFB, Texas. • The T-6 is flown by countries around the world including Greece, Israel, Iraq, Mexico, Morocco, New Zealand and the U.K.
• The modern T-6’s predecessor and namesake, the North American AT-6, was used in training, fighter, reconnaissance and forward air control missions. A pair of T-6 Texans fly in formation over Laughlin AFB, TX on May 19, 2004. The T-6 is replacing the T-37 as the primary trainer for Air Force pilots.  Archived in Airframes, History, Operational, T-6, Training and tagged Air Force, airman, airman magazine, Joint Primary Pilot Training, JPPT, pilot pipeline, pilots, training. Bookmark the permalink.